Athens, Ga. – University of Georgia entomologists are asking Georgians to help track an insect that loves to stow away in homes and has the potential to hurt the state’s cotton and blueberry crops. The brown marmorated stink bug, a native of Asia, was first spotted in Allentown, Pennsylvania, in 1998 and has since been found in 42 states and two Canadian provinces, according to the U.S. Department of Agriculture. To date, it is classified as a nuisance pest in Georgia, but could quickly become an agricultural pest, too. Paul Guillebeau, an entomologist with the UGA College of Agricultural and Environmental Sciences, decided to find out how many Georgians are unwillingly hosting the pest. He thought of the project after lying in bed at night and counting the number of stink bugs crawling on his Athens ceiling. To participate in Gullibeau’s tracking survey, go to www.surveymonkey.com/s/FCLPJLX. To date, more than 8,000 Georgians have responded. The three-question survey will remain open until responses begin to dwindle, and the state has been represented. Guillebeau likens the pest to lady beetles and kudzu bugs that also torment homeowners by slipping through the tiniest crack to find a warm spot indoors. The stink bugs are first attracted to light and then to the warmer temperatures indoors. “I think my house is fairly well sealed, but they are awfully good at getting inside,” he said. As temperatures begin to rise, the bugs are coming out of their winter slumber and searching for food and water. “Now they are flying to the windows searching for a way to get out,” he said. 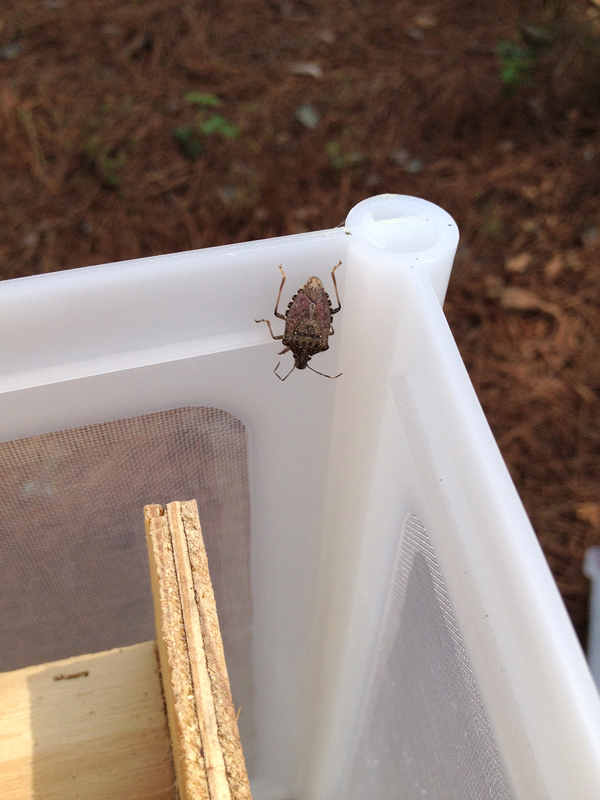 UGA research professional Brian Little began tracking the brown marmorated stink bug’s movement in January as part of a collaborative project with scientist Jim Walgenbach at North Carolina State University. Little set up stink bug stations at Gullibeau’s house, where he monitors the temperature at which the bugs come out of their diapause, or physiological state of dormancy. “This location is the most southern latitude for this study,” Little said. He collects live and dead brown marmorated stink bugs and measures the pronotum, which is the platelike structure that covers all or part of the insect’s thorax, the width of each insect and the weight of the live insects. Little will continue monitoring the bug stations through June. Little recently completed his master’s degree from the college on the UGA campus in Tifton where he studied how southern green and brown stink bugs affect cotton crops. Unfortunately, this is when the brown marmorated stink bug takes over. It attacks the larger sized, hardened cotton bolls. “They are more of an issue in apples, tomatoes and other fruit in the North and they have just recently moved into Georgia. We do not want them to become an issue in Georgia cotton production or get into our blueberries,” Little said. Once the brown marmorated stink bugs return to the outdoors, UGA entomologist Kris Braman hopes home gardeners will take a close, identifying look before killing them. “The brown marmorated stink bug damages a host of plants from ornamentals to trees to food crops,” she said. “But there are many other look-alike stink bugs and some of these are predators” that feed on harmful garden pests. Brown marmorated stink bugs have striped antennae, smooth shoulders and small mouthparts. Predator, or beneficial, stink bugs have solid antennae, spines or indentations to their shoulders and a “much stouter” mouth. “You may need a hand lens to get a close look, but it will be worth it because they eat harmful garden insects like the Mexican bean beetle,” Braman said.